Six existing 2m long sandstone troughs set vertically in pairs down the centre of the station platform, with bronze cast sculpture set in each. 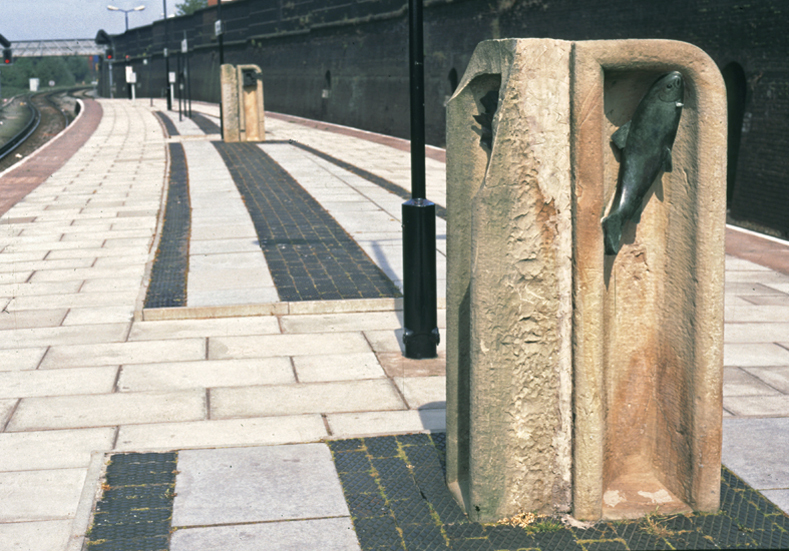 The bronzes had relevent themes to the nearby environment - ie a factory, boat, salmon, (recently reintroduced into the Mersey) rabbit, (the embankment was riddled with them) and the sun and moon to mark the passage of time in reference to time becoming standardised across the country - when railway timetables made this necessary. Associated paving design utilizing old BR stock. Plaster originals for bronze casts made by Philip and Diane, bronze cast by Castle Fine Arts Foundry, Oswestry. Paving and troughs installed by the BR team.